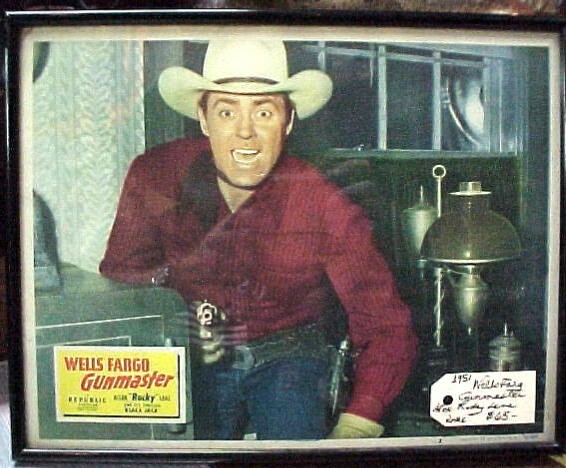 This is an original Lobby Card 11"X14" of the Movie "Wells Fargo Gunmaster" starring Allan "Rocky" Lane. He has his gun drawn and jumping in to suprise the bad guys. Great gift for a Wells Fargo Collector as well. This is an original Lobby Card 11"X14" of the Movie "Wells Fargo Gunmaster" starring Allan "Rocky" Lane. He has his gun drawn and jumping in to suprise the bad guys. Great gift for a Wells Fargo Collector as well. Please email cowboycabin@centurytel.net with questions or call 406 270-2842.